Another Wedding theme in Paper Quilling. I have tried to make "Kalasha" in Paper Quilling. Kalash literally means "Pot". It is a metal (brass, copper, silver or gold) pot with a large base and small mouth. 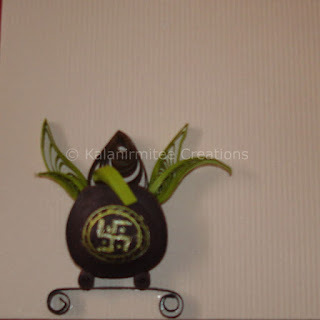 "Kalash" is a pot filled with water and topped with a mango leaves and a coconut.